The Snappi is a highly adaptable, special needs pushchair designed to accommodate a wide variety of seating needs. Particular care has been given to the aesthetics of the Snappi to prevent it from resembling the medical look of traditional, special needs buggies but rather maintain the modern, attractive appearance once thought to be reserved solely for high-street pushchairs. This attractive design is manufactured from high-grade aluminium which provides both strength and durability, yet is still lightweight, easy-to-fold and suitable for everyday use. Height adjustable push handles are fitted as standard to ensure the comfort and convenience of the attendant. The Snappi uses only the highest quality wheels and castors to ensure effortless manoeuvrability. Please note that a hub brake option is also available. The unique tilt in space facility is easily operated by a finger lever, mounted on the push handles, and offers an exceptionally high level of seat tilt between 0 and 40 degrees. There are no fixed positions for the tilt in space facility; rather, the occupant can be positioned at any angle within this 40 degrees range. The tilt in space mechanism is controlled by a slow-release gas strut which ensures both the comfort and safety of the child. The Snappi pushchair has been specially designed to offer an extensive range of growth to cater for your child’s growing needs; for example, a size 1 Snappi has a height adjustable backrest that offers up to 170mm of growth and a seat depth and hip width which are adjustable by up to 100 mm. Its full range of growth can be seen on our technical page or by clicking here. As well as offering a high-level of growth, the backrest reclines independently, by means of an easy-to-operate gas strut, and can be positioned at any point between its 90 to 140 degrees range of recline. If necessary, the Snappi can be fitted with a dynamic backrest and footrest. This allows the child to extend and push back against a relatively light resistance and then be able to recover into the desired seating position. The Snappi is also now available, at point of manufacture, as a rearward facing pushchair (when your child is facing you) making it ideal for parents, especially those of special needs babies, who need to see their child at all times. To further cater for our littlest clients, a seat minimiser is now available for both forward and rearward facing size 1 Snappis. The seat minimiser can be fitted either at the point of manufacture or retro-fitted by a technician. 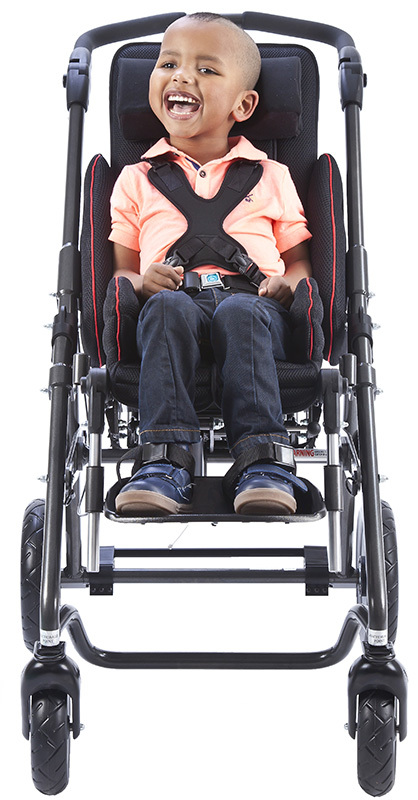 It enables the size 1 Snappi to be made smaller in order to ensure perfect postural support for even the smallest child - the full measurements can be seen on our technical page or by clicking here. All new Snappis now come as standard with our new style pin lock brake. This new brake mechanism is not only quieter to operate but also allows for a less strenuous movement to engage the brake. This exciting development manages to combine the stability and security of our previous mechanism with enhanced usability. Additional postural and everyday accessories are available for the Snappi to ensure each child’s individual needs are all catered for. Our full range of accessories can be viewed by clicking here. Often overlooked, younger brothers and sisters are also considered in the design of the Snappi. The Snappi includes an innovative, spring-loaded catch to other children from fiddling with the release lever and accidentally releasing the interface. The interface has hard-wearing stainless steel mounting points to prevent wear and a further safety mechanism to ensure the seat can only be put on the chassis correctly. The Snappi pushchair (forward facing models only) has been successfully crash tested according to ISO7176/19, ensuring safe transportation of the occupant in specially-adapted vehicles.